Finally, an opportunity to visit the beautiful new Roosevelt building! Planning Principal Aqueelha James will host an Open House from 10am to 12pm on Saturday, January 30th starting in the Roosevelt gym. We’ll start with an information session for prospective students, parents, and community members followed by a tour of the new facility. We were originally planning back to back open houses starting this Saturday, but it appears we may be getting a bit of snow this weekend — did you hear? Flyers in English and Spanish for the event are below as well as some photos of the new building. DCPS Chancellor Kaya Henderson will be at the MacFarland Middle School auditorium (4400 Iowa Ave NW) from 7 to 8pm on Thursday, December 17th to share updates on the Roosevelt High School Re-envisioning process. See flyer below for details. There was a question at the most recent Ward 4 Education Alliance meeting about where to find Roosevelt’s field soil report. You can find the report here on the DGS project page for Roosevelt. If you have questions or comments, please contact Jackie.Stanley@dc.gov. 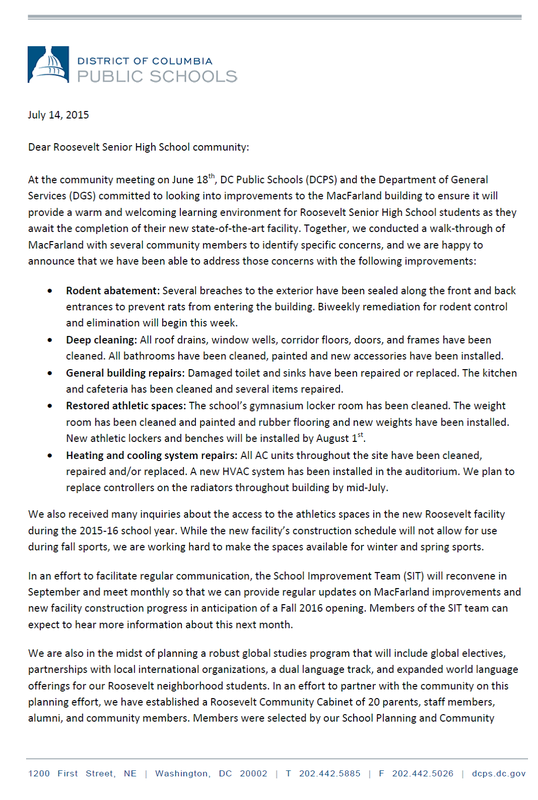 The DCPS School Planning Team is excited to announce the Roosevelt Senior High School Community Cabinet! The Cabinet will be an opportunity for community members to make recommendations to DCPS Chancellor Kaya Henderson about Roosevelt’s “re-envisioned” programming, launching with a global studies focus in School Year 2016-2017. We were pleased to receive nearly 40 applications from Roosevelt families, staff, feeder school parents, and Ward 4 community members. The School Planning Team worked with the Office of Family and Public Engagement to review each application based on applicant experience, interest in Roosevelt High School, and relationship to the Ward 4 community. We were committed to selecting a group that would represent Ward 4’s diverse communities to ensure rich discussions and a broad range of perspectives. The Community Cabinet will be responsible for (1) gathering input on proposed programming at Roosevelt from his/her community, (2) bringing that input to monthly Cabinet meetings, and (3) sharing updates and recommendations made in Cabinet meetings with his/her community. The Cabinet will begin meeting this fall to discuss a variety of topics, including dual language programming, global studies initiatives, and community partnerships. What’s your connection to Roosevelt High School? I am a parent of two children in a feeder school. I also live in the neighborhood and want to see the school serve as a world-class high school option for the community. What’s your connection to Roosevelt High School? I am entering my 4th year as a parent of Powell Elementary School students, and I am excited to be joining the Roosevelt Community, as the parent of 2 future Rough Riders! What’s your connection to Roosevelt High School? I am mother to a 1st grader who will attend one of Roosevelt’s feeder schools, Powell Elementary, next school year. I also live in the neighborhood. What’s your connection to Roosevelt High School? Current parent of 2 students at West Education Campus, founder of the West Parent, Staff & Community Organization (PSCO), lifetime neighborhood resident. Favorite summer time spot in Ward 4: My back yard! What’s your connection to Roosevelt High School? I am a parent of a Theodore Roosevelt student, I grew up in the community where Roosevelt is located and I am a District of Columbia firefighter that serves that community. What’s your connection to Roosevelt High School? I currently have son attending and I am the PTSA President! What’s your connection to Roosevelt High School? I have taught at Roosevelt SHS for three years. I teach Robotics, Engineering Design, Chemistry and Environmental Science. I am also the Girls’ Indoor and Outdoor track Coach. Favorite summer time spot in Ward 4: I’m totally flexible in terms of summer spots for summer fun! What’s your connection to Roosevelt High School? Vice President of the Alumni Association. What’s your connection to Roosevelt High School? I am an alumni and a parent of an alumni. I am also the God parent of a future ROUGH RIDER as well as an active person in the community. What’s your connection to Roosevelt High School? I’m a Ward 4 resident who cares deeply about local educational opportunity. In my professional life I study college access programs to help improve programs that support students in making their way to and through higher education. I’m also the mom of two little ones who will one day attend Roosevelt as our neighborhood school. What’s your connection to Roosevelt High School? I taught in Washington, DC for seven years. As a resident of Petworth, I’d like to use my experience to assist Roosevelt SHS in becoming one of the best high schools in the city and the country. What’s your connection to Roosevelt High School? Neighbor and ANC commissioner. What’s your connection to Roosevelt High School? I live in the community and have Roosevelt as my inbounds high school. What’s your connection to Roosevelt High School? While I have lived in Petworth for nearly a decade, our experience with DC schools is more recent (kids ages 7, 4, and 1) and serves as motivation to engage and advocate. What’s your connection to Roosevelt High School? Roosevelt is a school where our community members get the most important education of their lives. It is the most exciting place to be for our kids because they are going to get a world class education under the international theme and we’re very fortunate to have that for our kids. What’s your connection to Roosevelt High School? I have lived and taught in the neighborhood for 15 years. Tengo 15 años de vivir y enseñar en el vecindario. What’s your connection to Roosevelt High School? As a member of the Afro-Latino community and understanding the large number of Latino students attending Roosevelt, it is my intention that the Afro-Latino sector is included in all planning initiatives. Favorite summer time spot in Ward 4: I spend time at our library. What’s your connection to Roosevelt High School? I am the Advisory Neighborhood Commissioner who represents Roosevelt HS (and Powell). 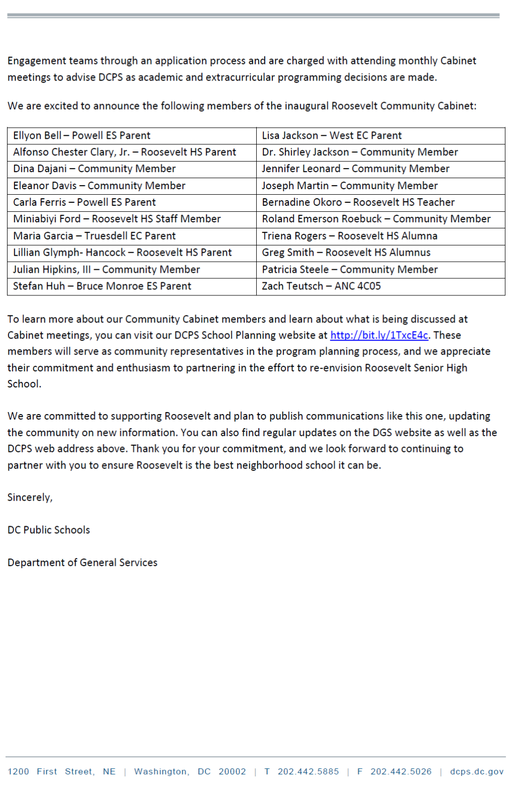 If you have any questions about the Roosevelt Senior High School Community Cabinet, please contact Julienne.Vinson@dc.gov or 202.478.1399. Over the past several months, we at DC Public Schools have engaged with the Roosevelt High School community about the future of the school. We’ve held meetings with the Roosevelt PTA, community organizations, feeder school parents, and even online forums. We’ve collected roughly 200 comments, questions, and pieces of feedback from people so far and are still working to gather input. Today we’re sharing what we’ve heard. Comments have been edited slightly so as not to identify particular people, but are otherwise unchanged. We will continue to add and share feedback as we hear more from the community, so please stay tuned for updates.